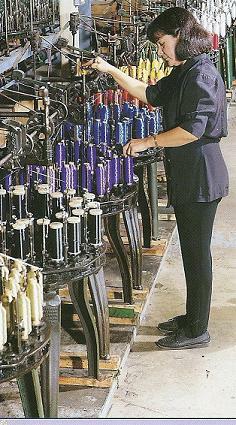 Synthetic Textiles, Inc. is a leading manufacturer of polypropylene braided solid cords, tubular sleeves, flat lacings, and specialty rope products. STI products are found in many applications in outdoor recreation products and camping supplies. There are numerous applications for STI cords, ropes and lacings, including zipper pulls, apparel drawstrings, eyeglass retainers, lanyards and tethers of all types on everything from portable electronics to sports equipment. Polypropylene ropes and cords offer strength and buoyancy in water. With STI braiding and weaving capabilities and manufacturing flexibility, development of special cords, ropes and sleeving for specific applications is never a problem. Years of experience, combined with the latest braiding technology, enables STI to offer an unlimited variety of braided and woven products in assorted colors, patterns, sizes and forms. STI can create your custom product or duplicate almost any existing braided or woven product for you.